We took the kids to Bass Pro Shop to see Santa. We've been taking them for the past 2 years and its a much nicer experience than waiting in line for an eternity at the mall. They have a great set-up for kids with coloring and crafts, free photo with Santa and lots of fun things to see and play with. Santa was really awesome too. My kids are terrified of Santa and strangers in general but he was great at breaking the ice and getting the kids interested in talking. It's just a dude in a red outfit but when you see how he talks to them and takes his time and he has such a twinkle in his eye, you feel the magic of St Nick. I posted my Pendleton 49ers on Instagram yesterday as I was trying to decide which one to wear but of course, I went with the most festive option. This 49er was an unbelievable find. There was once a dream of a vintage shop here in St Louis called The Bale-Out where you could buy bags and bags of vintage for super cheap. See my adventures at The Bale Out in a previous post. Sadly, they closed last year and I didn't even get to go to the store closing sale. I was a heart broken. One day a few months ago, I was at a Salvation Army thrift store when I found this Pendleton jacket with tags from The Bale-Out for $12! I know, I told you they were cheap. Well, the thrift store price was a buck. One whole crisp green dollar. This jacket had quite a bit of moth damage but hello- for a dollar?! Shoot, I would have happily paid $12. I brought it home, gave it some extra love with a needle and thread and its good as new! It still needs a matching button on one of the cuffs but I rolled the sleeves and you cant tell that it's missing one. I also finally got a chance to take photos of my beautiful holiday hair clip from Belle Blossoms. Right now, she is having a sale on hair flowers. Save 20% off using code BLOSSOMS2013 and get a free gift with purchase of $50 or more now until November 23rd. I love this wintery clip so much, you'll probably see it a lot in the next few months! 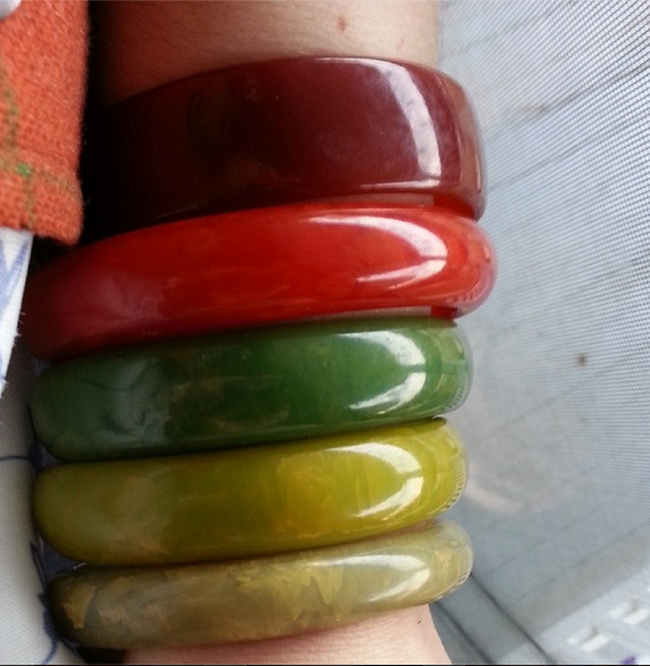 I wore all of my chunky red and green bakelite to match my lovely Pendleton, including the 2 light green ones, which I scored a Goodwill recently for $2 each! I think this will be my new autumn uniform. You look so beautiful, Brittany! The hair, makeup, and outfit are all lovely. Your Pendleton looks great. I'd love to know your technique for patching moth holes. Have you made a tutorial... or maybe be willing to do one in the future? Thanks! Thanks for featuring our clip. I wish I had thought, we could have given one to one of your readers. So incredible cute!!! Love the pendleton and LOVE the hair clip! Lovely outfit Brittany and you look grand sporting your wonderful hair accessory. Gosh all those great scores! You really know how to find the right deals! Our Goodwill has Kohl's castaways:) These really are wonderfully taken images. Thoroughly awesome outfit and thrifting luck! I love these warm, classic autumnal hues on you (they're firm faves of mine, too). Everything out this look is sweet, cozy and beautiful! I really love this look. Especially your pencil skirt. Looks fabulous with the 49er. This outfit is perfect on you! I can't believe how cheap you vintage is in the USA....any whiff of anything old in our Op shops the price goes up to rip off proportions! Also lovin that Bakelite stack. Seriously, look at the picture (link above) and that last pic of you. It's uncanny! I looked at that article and it is amazing! You look adorably seasonal! I love everything about your outfit, and am very envious of those boots. Your hair looks fabulous as well. What a lovely jacket and fabulous colours on you! Lovely outfit - I only wish I could come by vintage items for those sorts of prices a bit more often! I keep checking the charity shops where I live but so far no mega-bargains. Super cute and what a lucky find! Occasionally I will find something at a local thrift store with tags from a local antique shop...apparently those people didn't like their purchases! I have a very similar Pendleton coat but in different colors. I love it as it's light weight but still warm. Perfect for those cool fall days. Super cute outfit! You look so pretty, and I just LOVE that photo of you on the grass with all the leaves, and the kids in the background - it's so autumnal and relaxed and lovely! I recently found your blog, and have been pouring through it. You are gorgeous, your clothes are beautiful, and you make wearing vintage look good. I am so happy to see you encouraging others to accept who they are, no matter what size/shape they are. Just as people are different genetic heights, people will be different genetic sizes/shapes as well. I bet St. Louis is still a great place to find vintage items due to the quality locally owned clothing, furniture, and department stores that flourished in the 1950s and 60s when I was growing up. One dollar for your 49er is fabulous no matter how many moths beat you to it. I have a 49er in perfect condition I got for $20 at an estate sale. It is one of my most cherished pieces of clothing along with those I acquired from my mother who frequented Peck and Peck, Saks, and other St. Louis women's apparel stores.